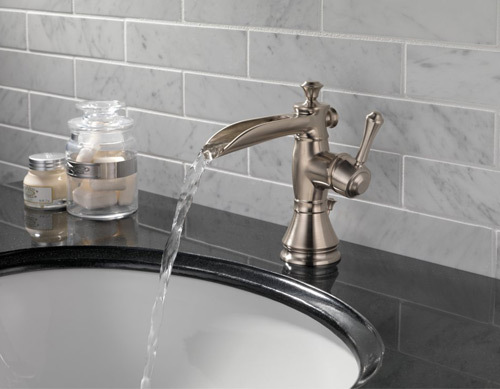 For all of the different styles and designs of faucets, they're all just variations on the same theme. They're all just jutting pieces of metal, hanging over our sinks, bathtubs and showers. No matter what brand, or model that you own, it all boils down to the same boring thing. Water is supposed to be the element of creativity, so how is it that when it comes to faucets, it seems that's there's been no innovation, no movement, none of these things are vital associates of water? The designs we use have been functional and practical for so long, designers seemed to stop looking for anything else, until recently. There's been an innovation, a flourish of creativity where design meets functionality. The idea has been around for some time, but only now has its newfound popularity allowed it to be utilized in everyday homes, not just those whose pocketbooks ends in more zeroes than most of us will ever see in a lifetime. It's called a waterfall faucet. Waterfall faucets don't come with any new parts, even though the design is very different. Most come in a glass plate design, meaning an angled glass tray hangs several inches above the basin by a long cylinder and in the middle of the plate, a long rod points into the air. This may be confusing at first and not to mention a little worrisome, but it's really very simple. All you have to do is turn the handle and water pours down over the plate and cascades in a soothing waterfall. If this design is too new, too bold, there are other more vintage styles available. These are called spout faucet designs. These look like old fashioned pipes, like a pump for a well. They are available in nickel, pewter, or brass. They offer a more familiar style, while still offering the same innovation. With the simple spout faucet design, it makes them easier to clean and maintain. Waterfall faucets aren't just for sinks, they're available for your shower as well. They're suspended above the head instead of being anchored to the wall. Also, they don't spit at you like a traditional shower head, but the water falls naturally in a graceful and calming flow over your body. It's like washing in the rain, but in the privacy of your home. 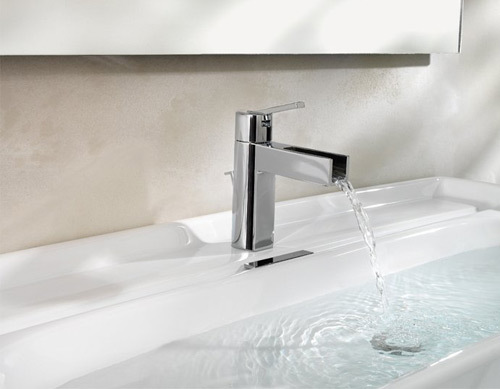 The sounds and functionality of these faucets can bring more beauty and a natural feel into your home. Every year, people spend thousands of dollars on sound machines and nature CDs. With a waterfall faucet; every time you turn on your faucet, whether it is to wash dishes, to get a glass of water, or to bathe, the relaxing sound and sensation of your waterfall faucet will transport you. Things that were just banal every day actions will become a time of peace and enjoyment. The stress of the day will melt away in the soothing rivulets of water and create a more positive, brighter energy in you and your home.